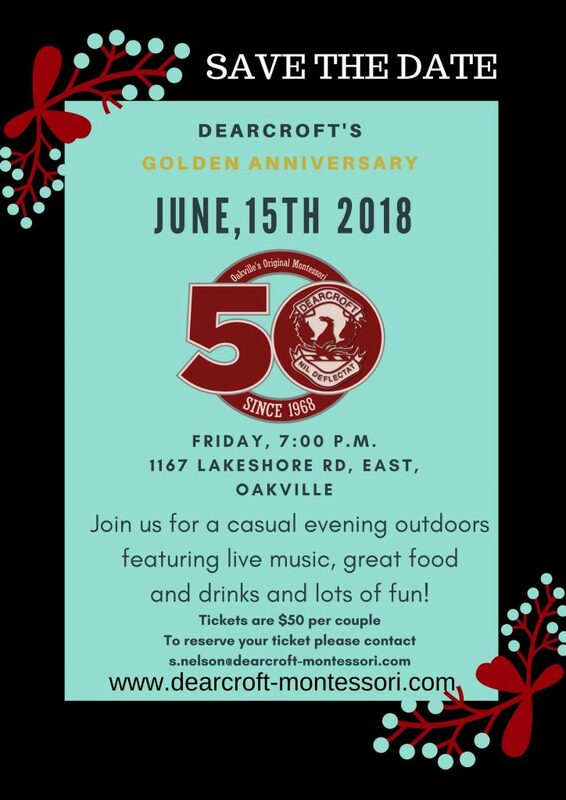 Come celebrate Dearcroft’s Golden Anniversary! It’s time to celebrate! Join us for a relaxed evening as we mark our Golden Anniversary. 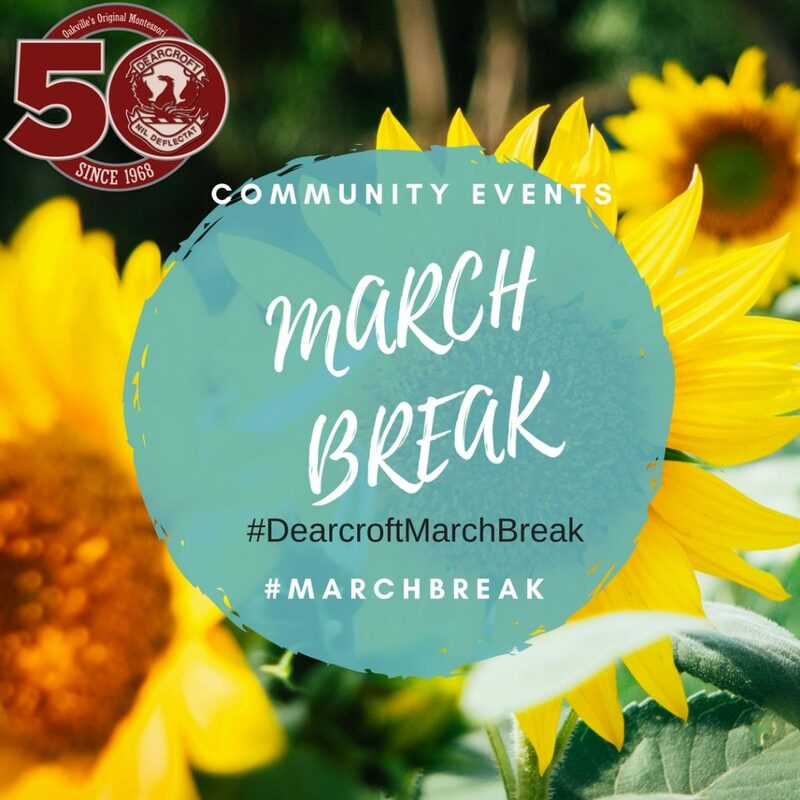 This will be a great chance to spend time with those connected to Dearcroft, both past and present. Enjoy an adult night out in our natural campus with lots of food and drinks and live entertainment. We look forward to celebrating this milestone with you! There will be lots of food and drinks and live entertainment all night long. Seasons Restaurant has generously donated a dinner party for eight in their private wine cellar to enjoy a tasting menu paired with wine. This amazing prize valued at $800 will be raffled off so please bring cash to buy raffle tickets (5 tickets for $10 or 15 tickets for $20). Cheque or Cash: Send a cheque (made out to Dearcroft Montessori School) or cash with your child to school. Tickets will be sent home with your child. E-Transfer: Dearcroft will accept e-transfers at info@dearcroft-montessori.com Please remember to send a separate email with the password. Tickets will be sent by email. 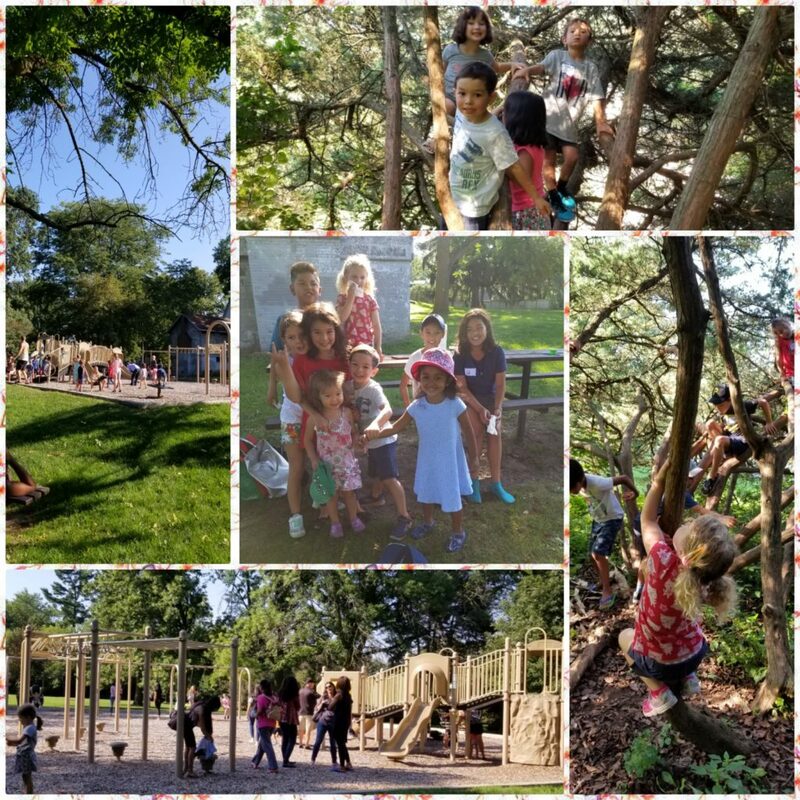 By mail: Send a cheque to Dearcroft Montessori School at 1167 Lakeshore Road East, Oakville, ON L6J 1L3. Tickets will be sent by mail or email. Let us know your preference and provide the necessary information. 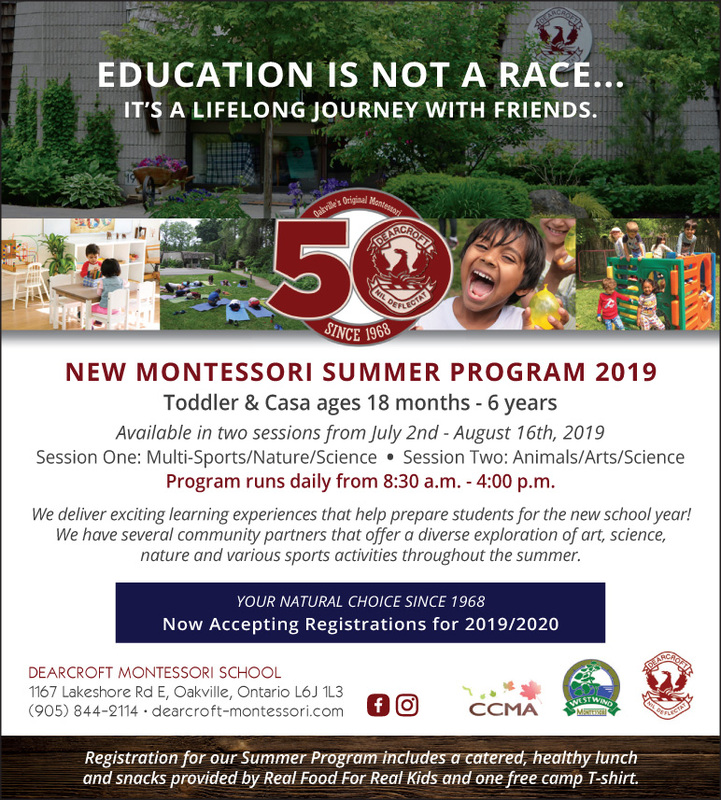 In person:Drop by Dearcroft Montessori School and speak with the Administration. Participants must sign up in-store prior to event, space is limited. Child must be accompanied by an adult. Visit your local store for details. Plus: Play-Doh play and colouring sheets everyday for those young ones tagging along with their siblings. Come on down to Bear Country where Brother Bear, Sister Bear, Papa Bear, and Mama Bear sing and dance in this colorful new musical filled with fun for the whole family. Adapted from the classic children’s book series by Stan and Jan Berenstain, The Berenstain Bears LIVE! brings everyone’s favorite bear family to life in a thrilling theatrical experience that kids as well as their parents will treasure for many years to come. Join us as we create crafty characters with Klutz® and discover your inner artist with ORB hi.def creation system™ – the future of colouring! It’s on! Bring the whole family in and test your skills with Hasbro Games. Plus, get ready to pop the lid off your imagination with Play-Doh. Celebrate the 60th Anniversary of the LEGO Brick and play the Wheel of Creativity! Use your imagination to build a LEGO model & take home your very own deck of Building Cards, available only at Indigo! Create an ooniverse with the Oonies Inflator! Plus, let your imagination soar with a fold & fly activity from Usborne, the perfect take home! Trouble is on the horizon! Help us save the day by jumping aboard the PAW Patrol Sub Patroller! Plus make your own Sea Patrol craft! Beale Street Cookie Class at Mad Hatter Tea Co is just around the corner! $10 for 2 cookies, including all the cookie bling and tea for two! Our Friday afternoon Kids Yoga classes are SPECIAL! They have themes, they are 1.5 hour and they have snacks and tea. This allows Moms & Dads to enjoy mindful moments of their own as well.